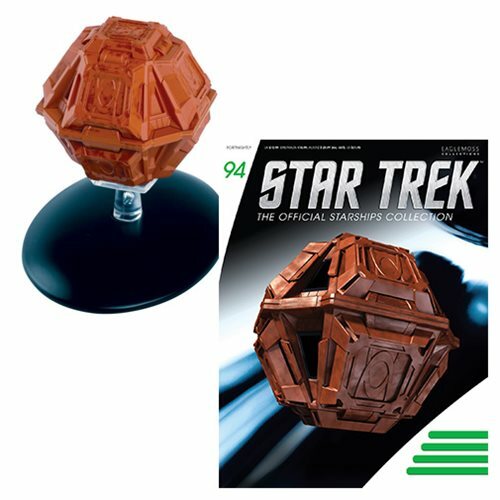 This Star Trek Starships Suliban Cell Ship Vehicle with Magazine #94 is part of the incredible collectible collection of Star Trek models that includes all the most significant ships from the five Star Trek television series. It showcases the unique vessel from Star Trek: Enterprise and comes with a display stand. Every ship is painstakingly recreated in die-cast metal and high-quality ABS materials, and then hand painted with an amazing level of detail. The collection features a full range of Federation and alien vessels, including seven incarnations of the Enterprise and all the major Klingon vessels (including the bird-of-prey), plus Dominion, Borg, and Romulan ships… all sold separately. Collect them all! Ages 14 and up.